There are almost as many ways to get San Diego Zoo tickets as there are flamingos in the zoo. The easiest and most expensive way is to walk up and buy them at the entrance, but there are plenty of other options, which are outlined here. Here's something to think about, though: The San Diego Zoological Society is not government funded, and your admission fees help them rescue vanishing species. Anyone aged 3 and older must have a ticket. Child ticket prices are available for kids 3 to 11. You can buy tickets at the gate. Get them ahead of time on your smartphone or tablet, and you'll get a barcode which will be scanned at the gate. Buying online, not only can save you time but may save you a few extra dollars too. One-Day Tickets: One-day passes include a guided bus tour, the Kangaroo Express hop on/hop off the bus, unlimited rides on the Skyfari aerial tram and all regularly scheduled shows. Get a 1-Day Plus Pass, and you also get into one 4-D show. Two-Visit Pass: Combined San Diego Zoo and Safari Park tickets, it saves about 10% compared to buying them individually. Check current ticket prices on the San Diego Zoo website. The San Diego Zoo offers a variety of extra animal experiences. Special before-hours and after-hours tours, behind the scenes - and other VIP experiences - come with a (sometimes hefty) extra cost. The one thing you will not pay extra for at the San Diego Zoo? Parking is free. 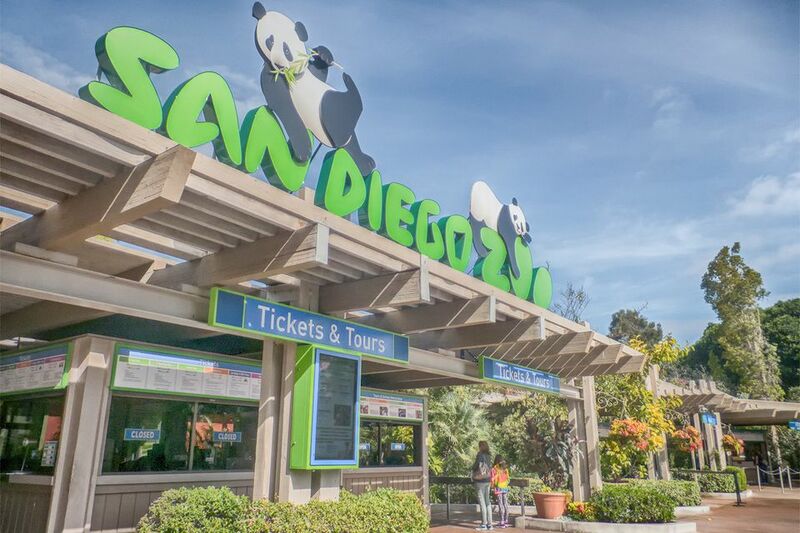 The options below will give you a discount of 10% or more on San Diego Zoo tickets. If you've failed to take advantage of any of them ahead of time, check with your hotel to see if they offer discounted San Diego Zoo tickets. Senior Citizens: If you're more than 60 years old, you can get 10% off your San Diego Zoo tickets at the gate, but the discount is not available online. Military Personnel: Bring your military ID to get a free Best Value ticket. Ask about discount passes at your work or through any organizations you belong to. If you're visiting several area attractions during your vacation, one of these combination passes may save you money. Don't just buy one without checking it out first, though. Get out your calculator or sharpen your pencil to be sure you'll really save money on the things you plan to use it for. San Diego 3-for-1 Pass: Includes unlimited admission to the San Diego Zoo, the San Diego Zoo Safari Park, and Sea World for up to five days. Southern California CityPass: If you're going to Disneyland, too, this is a great money-saver. Find out more about whether it's the right choice for you in the Southern California CityPASS guide. Go San Diego Card: This card offers a lot of attractions at a reasonable price. Use this handy guide to find out all you need to know about it. Balboa Park Passport: This one may be a good deal for you if you're going to some of the other museums in the park, too. Promotions and coupons come and go, but you can sometimes find discount coupon codes at RetailMeNot. The zoo sometimes offers free admission for children ages to 3 to 11. To find out when, check the San Diego Zoo Kids page.